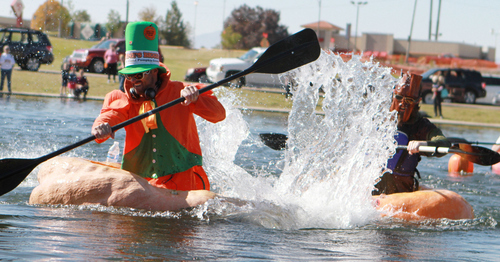 Keith Johnson | The Salt Lake Tribune Kyle Fox, left, and Jordan Rogers race to the finish line during the first heat of the Pumpkin Regatta at Sugar House Park in Salt Lake City on Saturday. Participants raced pumpkins weighing between 500 and 1,000 pounds. Keith Johnson | The Salt Lake Tribune Cheryl Shelley, left, Carrie Fox, Dan Farr and Aubrey Kruisman compete in one of the heats during the Pumpkin Regatta at Sugar House Park in Salt Lake City, October 19, 2013. Participants raced pumpkins weighing between 500 and 1,000 pounds. Keith Johnson | The Salt Lake Tribune Kyle Fox, left, paddles past Dan Farr during the Pumpkin Regatta at Sugar House Park in Salt Lake City, October 19, 2013. Participants raced pumpkins weighing between 500 and 1,000 pounds. 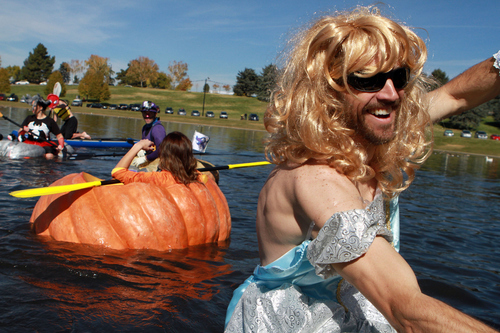 Keith Johnson | The Salt Lake Tribune Robb Baumann wears a cinderella costume while participating in the Pumpkin Regatta at Sugar House Park in Salt Lake City, October 19, 2013. Participants raced pumpkins weighing between 500 and 1,000 pounds. Keith Johnson | The Salt Lake Tribune Matt McConkie rocks the pumpkin of Lindsay Bench during the Pumpkin Regatta at Sugar House Park in Salt Lake City on Saturday. Participants raced pumpkins weighing between 500 and 1,000 pounds. Keith Johnson | The Salt Lake Tribune Lance Heaton waits in his giant hollowed-out pumpkin to compete in the Pumpkin Regatta at Sugar House Park in Salt Lake City, October 19, 2013. Participants raced pumpkins weighing between 500 and 1,000 pounds. Keith Johnson | The Salt Lake Tribune Kyle Fox participates in the Pumpkin Regatta at Sugar House Park in Salt Lake City, October 19, 2013. Participants raced pumpkins weighing between 500 and 1,000 pounds. Keith Johnson | The Salt Lake Tribune Carrie Fox, center, battles with Dan Farr, left, and Aubrey Kruisman during a heat of the Pumpkin Regatta at Sugar House Park in Salt Lake City, October 19, 2013. Participants raced pumpkins weighing between 500 and 1,000 pounds. 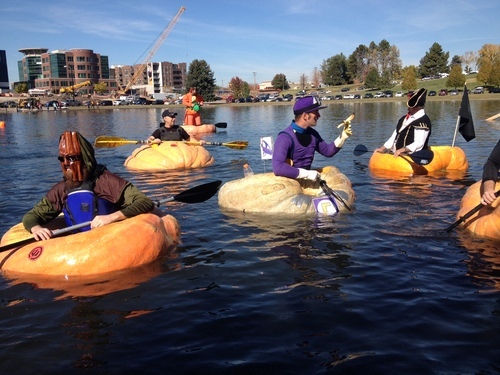 Keith Johnson | The Salt Lake Tribune Racers prepare to paddle their hollowed-out giant pumpkins at the Pumpkin Regatta at Sugar House Park, Oct. 19, 2013 in Salt Lake City. 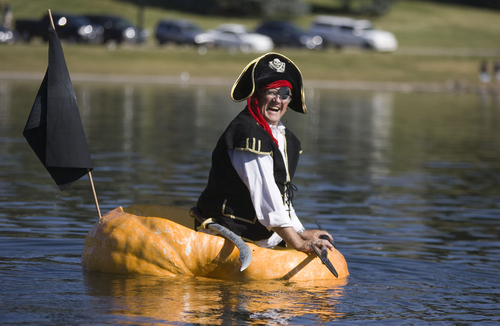 Keith Johnson | The Salt Lake Tribune Pirate David Bradley waits in his hollowed-out pumpkin for the first heat of the Pumpkin Regatta at Sugar House Park in Salt Lake City on Saturday. Participants raced pumpkins weighing between 500 and 1,000 pounds. 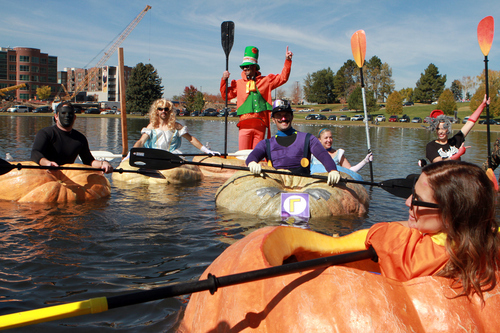 Keith Johnson | The Salt Lake Tribune A crowd of spectators watches costume clad pumpkin paddlers participate in the Pumpkin Regatta at Sugar House Park in Salt Lake City, October 19, 2013. Participants raced pumpkins weighing between 500 and 1,000 pounds. 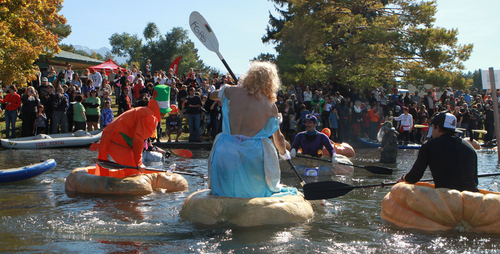 Keith Johnson | The Salt Lake Tribune Costumed pumpkin paddlers acknowledge the crowd assembled on the bank of the pond at Sugar House Park following the Pumpkin Regatta in Salt Lake City, October 19, 2013. Participants raced pumpkins weighing between 500 and 1,000 pounds. 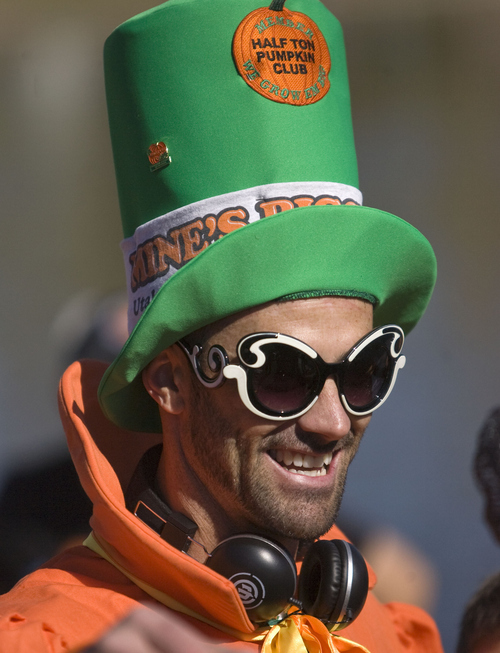 Keith Johnson | The Salt Lake Tribune Kyle Fox celebrates after winning the championship heat during the Pumpkin Regatta at Sugar House Park in Salt Lake City, October 19, 2013. Participants raced pumpkins weighing between 500 and 1,000 pounds. 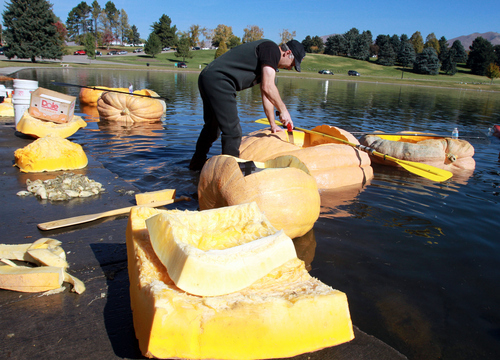 Keith Johnson | The Salt Lake Tribune Andrew Israelsen puts the finishing touches on a giant hollowed out pumpkin in preparation for the Pumpkin Regatta at Sugar House Park in Salt Lake City, October 19, 2013. Participants raced pumpkins weighing between 500 and 1,000 pounds. 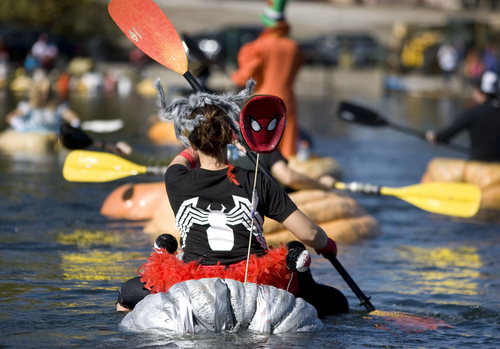 Keith Johnson | The Salt Lake Tribune Aubrey Kruisman dressed as Spider woman paddles her giant pumpkins in the pond at Sugar House park during the Pumpkin Regatta in Salt Lake City on Saturday. Participants raced pumpkins weighing between 500 and 1,000 pounds. Ahoy! 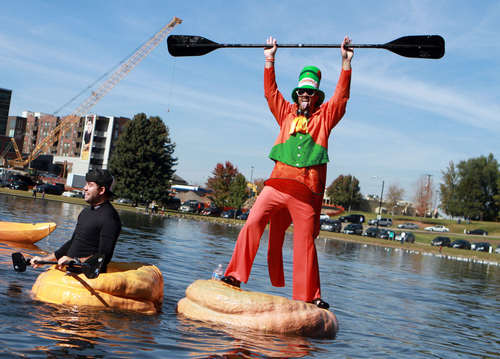 The third annual Ginormous Pumpkin Regatta rowed its way across Sugar House Park&apos;s pond on Saturday. 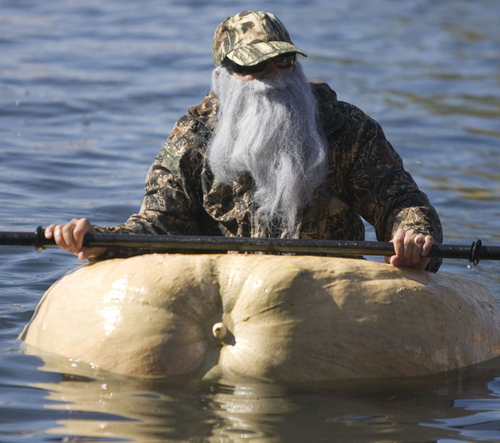 Captains of watercrafts made of pumpkins weighing between 500 and 1,000 pounds competed for prizes  awarded to winners and losers. Above • Kyle Fox, left, and Jordan Rogers race to the finish line. Below • Matt McConkie, left, rocks the pumpkin piloted by Lindsay Bench. Aubrey Kruisman, dressed as Spider-Woman, paddles her pumpkin. David Bradley offers his best pirate grin in his hollowed-out ship.